Outsign is a creative multi-purpose Wordpress Theme based on Visual Composer. 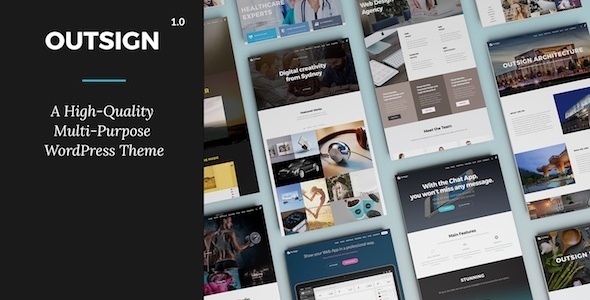 With itâ€™s 21 demos you can create great sites for any needs: agency, freelance, designer, web designer, developers, marketing, startup, blog, magazine, portfolio, photography, architect, corporate, business,fitness, musician, restaurant, medical and ecommerce shops. Outsign comes bundled with the great drag-n-drop page builder Visual Composer and one of the best slider plugins Revolution Slider. If you are searching for a great multi-purpose WordPress Theme, Oustign is one of the best. Clean, modern design for any purposes. Server requirements: PHP 5.3 or greater, max_execution_time 120, memory_limit 96M, max_input_vars 3000, post_max_size 32M, upload_max_filesize 32M, allow_url_fopen ON.